Semiconductor giant Intel (NASDAQ: INTC) reported third-quarter results after the closing bell on Thursday. The company exceeded its own projections by a wide margin and set optimistic goals for the end of this fiscal year. Here’s what you need to know. For the record, Intel’s guidance for this quarter pointed to GAAP earnings of $0.72 per share on sales of approximately $15.7 billion. The headline numbers never tell the whole story. Let’s dig a bit deeper. 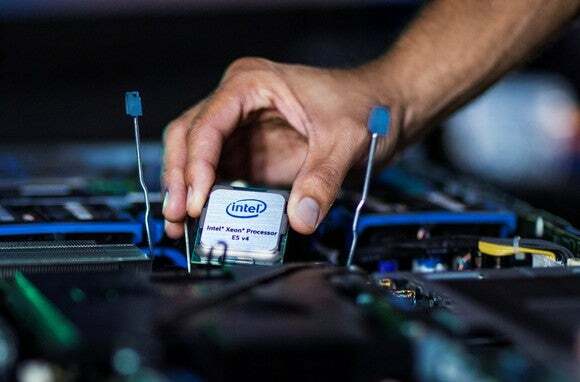 Four of Intel’s five reportable business segments delivered significant year-over-year sales growth, led by a 37% increase for the non-volatile memory group and a 23% boost in the Internet of Things (“IoT”) division. Together, these two segments accounted for 11% of Intel’s total sales, up from 8% in the year-ago quarter. The client-computing group delivered third-quarter sales of $8.9 billion, flat year over year and representing 55% of the company’s total revenues. In terms of operating profits, the client-computing segment boosted its contribution by 19%, to land at $3.6 billion. Here, the fast-growing memory and IoT groups contributed $94 million in total, up from $57 million a year ago. Net and operating margins widened thanks to lower operating costs. Intel’s operating expenses took a 4% haircut, led by a 17% lower budget for marketing, general, and administrative costs. The research and development (R&D) budget received a 5% boost. Fourth-quarter sales should land near $16.3 billion, in line with the revenue report from Q4 of 2016. Backing out revenue contributions from the spun-out McAfee division in the year-ago period, we’d be looking at a 3% year-over-year gain. GAAP earnings were guided to $0.80 per share, up from $0.73 per share at the end of 2016. McAfee’s impact on the bottom line was too small to make a difference. Intel’s full-year revenue target held steady, at $61.3 billion, but the unadjusted earnings per share (EPS) guidance was lifted from $2.66 to $2.93. Intel CEO Brian Krzanich highlighted strong execution across the board, leading the company toward record financial results in 2017, as a whole. Beyond that, the beefy research and development (R&D) budgets are paying dividends. “Intel’s product line-up is the strongest it has ever been with more innovation on the way for artificial intelligence, autonomous driving and more,” said Krzanich in a prepared statement. This quarter’s growth was built on a varied melange of business opportunities. The heady growth of nonvolatile memory sales rested on innovations such as 64-layer 3D NAND memory chips and the high-speed Optane product line . The larger data-center division is exploiting healthy orders from cloud-computing vendors, and the behemoth client-computing group lets notebook processor sales make up for falling desktop product volumes. Intel published a three-year operating plan at the end of 2016. The company is tracking ahead of its stated goals, three quarterly reports into that plan. The recent Mobileye acquisition also positions Intel to explore the autonomous-driving market in its formative years, forming partnerships with several top-tier carmakers along the way. Mobileye’s results are currently baked into the “all other” operating segment, which contributed just $202 million of top-line sales and an operating loss of $947 million in the third quarter, but this is a $15 billion bet on an emerging market . David and Tom just revealed what they believe are the 10 best stocks for investors to buy right now… and Intel wasn’t one of them! That’s right — they think these 10 stocks are even better buys. Anders Bylund owns shares of Intel. The Motley Fool recommends Intel. The Motley Fool has a disclosure policy .